In the United States, each coin from the US Mint is eligible for a redesign after 25-Years. The Indian Head Cent was placed into circulation in 1859 and after 50 years, it was due for a replacement. World famous designer Augustus Saint-Gaudens was charged with the redesign of all coins of the Mint, including the Cent. He was selected in part because of his other art work depicting beautiful god and goddess-like imagery. Saint-Gaudens mandate, straight from President Roosevelt himself, was to capture the majestic beauty of the coinage of Greece, which Roosevelt, thought was far superior to the current series offered by the Mint. Saint-Gaudens designed two coins before his untimely death, the Gold Double Eagle and the Gold Indian Head Eagle. After he passed, his replacement designer, Victor David Brenner (“VDB”) was chosen because of his other work for Roosevelt. Brenner had designed the Bronze Bust of President Lincoln, the likeness of which is the same as the one ultimately used on the new cent. On August 2, 1909 the Brenner design was put into circulation. The coin depicted Lincoln’s profile on the front (aka the obverse) and two wheat shafts on the back (reverse). The Artists initials, “VDB” were prominently displayed on the reverse at the bottom, between the two shafts of wheat. Apparently the Chief Secretary of the Treasury Franklin MacVeagh, had never actually take time to study the coin in detail. The story goes that MacVeagh, upon seeing the coin, was outraged that the artist’s initials “were so big.” They were much larger than other initials on other coins of the day. Three days into circulation, MacVeagh ordered the immediate halt of production and ordered Victor David Brenner’s “VDB” initials removed all together, a few days later the coin went back into production, this time without any recognition what-so-ever of the coin’s designer. This action sent the VDB coin’s interest into the stratosphere. Less than 500,000 1909-S VDBs were produced at the San Francisco Mint. This coin is one of the most sought after today. As for Brenner, he understandably expressed outrage. He went on a writing campaign that became very public. Unfortunately for him (and fortunately for the numismatic community), his initials were not restore until Chief Engraver (and chief critic of Brenner) Charles Barber’s death in 1917. The next time his initials were placed on the coin was in 1918, when they were put on the Lincoln’s shoulder on the obverse in tiny letters. This is where it remains today. The reverse of a 1909-S VDB cent image used is licensed under the Creative Commons Attribution-Share Alike 3.0 United States license and attribution is as follows – Coin: Victor David Brenner, Image by Lost Dutchman Rare Coins. 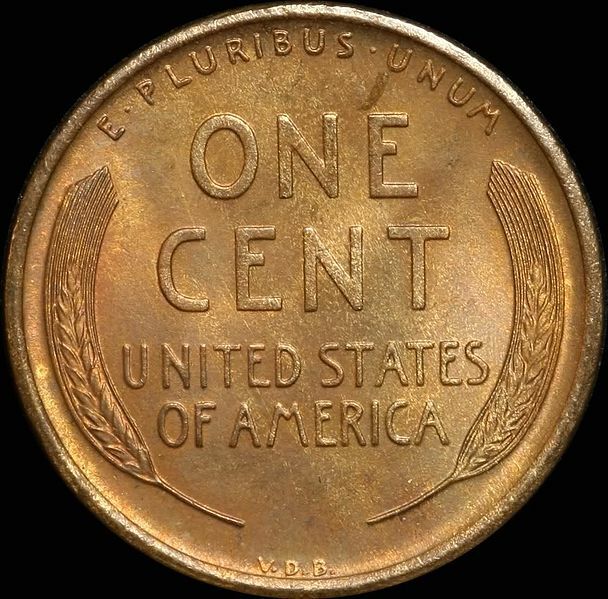 1909-VDB Lincoln Cent. Very Nice Coin & Very Nice Date & condition.